The database of thousands of USCG deck license exam questions is one way to get extra practice with most types of navigation problems. 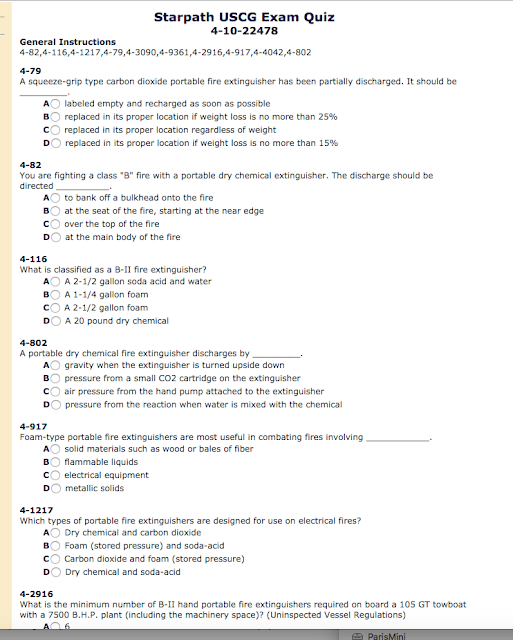 We offer a unique interface to these questions to all students signed up in any of our online courses. This free option is not part of our regular assignments, and not all participants choose to use them, but the resource is available, and we do offer support on the solutions, so long as they are within the realm of navigation or weather. We do not offer support on the questions for deck general or safety, or things like that. Our interface is unique in that you can chose random questions from any of the groups (Rules of the Road, Deck General, General Navigation, Safety, Navigation), or you can create custom practice quizzes to your own design. 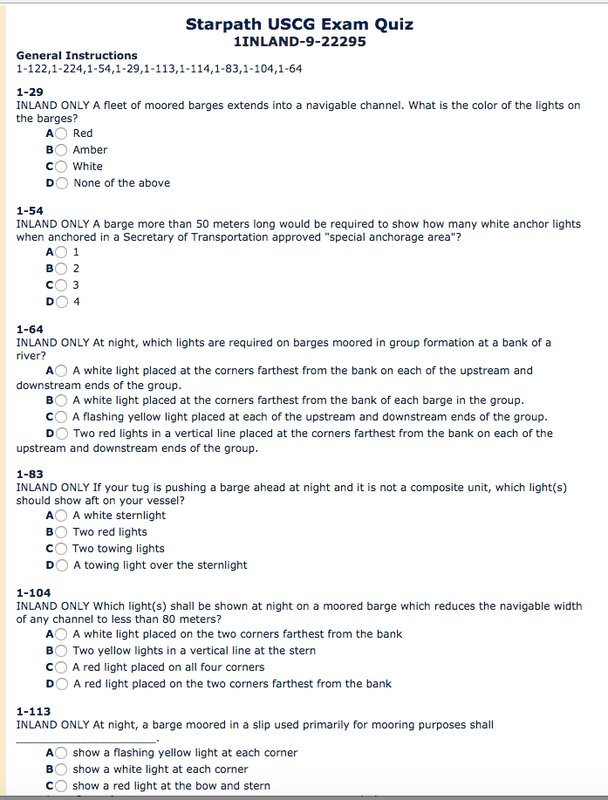 For example, you can ask for all Nav Rules questions the USCG has ever asked on the subject of Barge Lights; or ask for all cel nav questions on amplitude; and so on. Below is the part of the first page on a query on "barge" for inland rules. You could to the same, for example on the words "narrow channel" or "fairway." 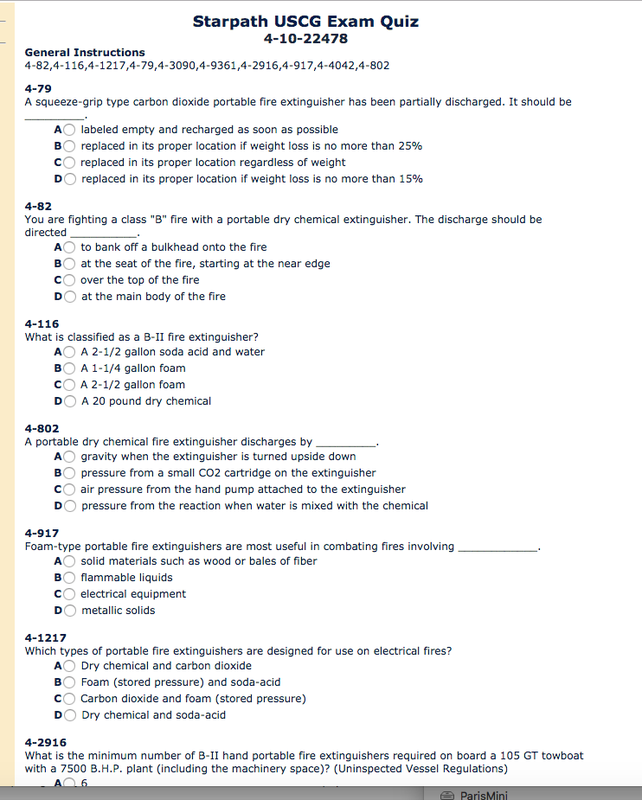 Here is another example asking for "extinguisher" in the Safety dataset. Again, you can ask our instructors for help on the barge lights, but not the fire extinguishers! There are thousands of questions, so if you want more practice, you have got a lot of options. To work the cel nav questions you will need a 1981 Almanac, and to work the tide and current problems you will need several specific outdated tables, which I think we have pdf copies of if needed. We do not have much call for that since we cover those topics thoroughly in our own materials. Most of the others nav and weather questions are generic. Enrolled students can just post a note in their respective Student Discussion Forums and we will provide the access to you. If you are not enrolled in any course at the moment and do not have an active webcard, then you would need to either purchase a webcard, or extend your existing one. Note that many products we sell automatically include a webcard, which gives you access to the custom or random quiz generator—to make it random, just choose a dataset and submit with no keyword. The webcard, provides access to all of the resources listed as well as the opportunity to post your own questions to our instructors in the Public Discussion Forums. 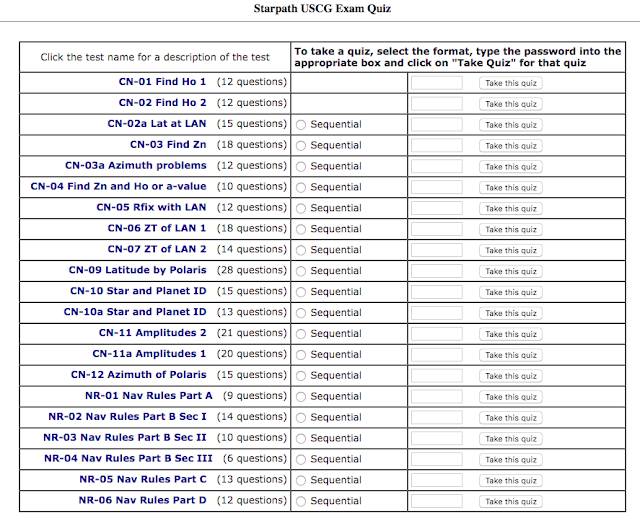 The quiz generator is in the Resources section, under Library / Practice Problems. Here is a note on the history of the public access to these questions. I want to stress that Starpath School of Navigation is not focused on USCG license exam preparation. There are many experienced facilities around the country that are USCG approved for that purpose. They are a better resource if a license is your main goal. They issue the tests themselves, so they know the best way to teach what you need. We offer these questions to our students (as they appeared when last in the public domain) only for the purpose of providing optional extra practice—and we offer support on how to solve these problems.